What Can a Vector Logo Be Used For? If you are a small business, why would you want to have a vector logo? What can it be used for where a raster based logo would not achieve the same results? Because a logo can change size infinitely if it is in vector format, it is ideal for applications where the logo would be displayed at a very large size. But there are also some small size applications where a vector will yield better results (particularly if colours are limited for output). Signage is a popular application for a vector logo. This can be large format outdoor signage printed on a flat substrate such as vinyl or even a carved, three-dimensional sign. Tradeshow booths that include a logo will benefit from a vector logo as it will be crisp from any viewing distance. 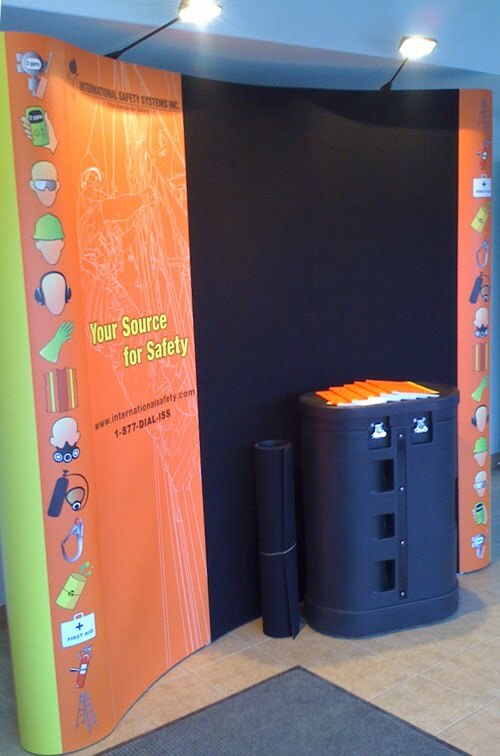 above: photos of two large format items that I designed for International Safety Systems Inc. that utilize vector artwork – outdoor signage on the top, a tradeshow booth on the bottom. Small scale applications where a vector may be preferable to a raster format include engraved badges, silk screen printing (on T-shirts or other products), and embroidery. Stickers and magnets are great promotional tools, and a vector logo could help you limit colours in printing these items. This is only a small list of examples, a vector logo can really be used almost anywhere, and additional formats can be exported from a program that can open vector graphics (such as Adobe Illustrator), so that raster formats at fixed sizes are available for specific applications such as websites and PowerPoint presentations. When it comes to print, you almost always want to choose a vector format for your logo, to ensure the highest possible quality. A logo with clean, crisp edges conveys professionalism, trustworthiness, and pride in the brand. If your logo has rough or jagged edges, it can have negative connotations and potentially be harmful to your branding efforts. That brings us to the end of this series. I hope that readers found this series informative and that it helps at least some company representatives better understand what the benefits are to having a vector logo. Any further questions, please add a comment on any post in this series (if you’d like to be notified of a response, please make sure you have checked the box to have follow-up comments emailed to you). If there are a lot of questions, I may collect them in an extra post in addition to answering in the comments.